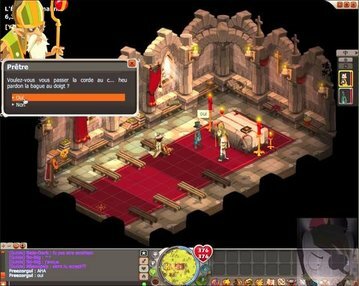 Marriage on Dofus is available between players of opposite and even the same genders. Once Married couples can choose to teleport to their spouse so long as you are within 15 maps of them and they aren't in any special areas. To get Married players need to purchase wedding rings, there are various other wedding accessories players can buy but those are optional. Players then need to equip the rings and meet at the church. Here players will need to speak to the priests to undergo the wedding ceremony and will have to accept to get Married. If things don't work out players can choose to divorce by speaking to the priest and paying him 50.000 kamas, alternatively if a spouse is offline for over 6 months then the divorce will be done automatically without having to pay.